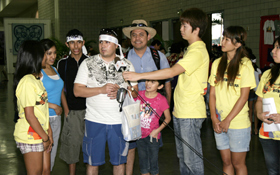 Firstly, the students interviewed the guests and performers at the Hawaii Convention Center. 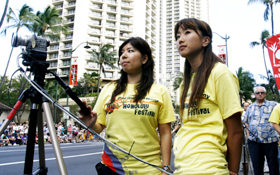 Secondly, they live streamed the Grand Parade online which was held on the final day of the Honolulu Festival. Furthermore, 36 students of the Japanese Language Class from Kapiolani Community College participated in the project this year. 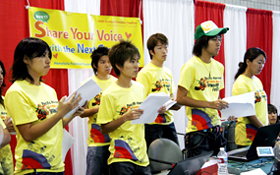 The project was titled “Share Your Voice with the Next Generation” which the booth was set up inside the Hawaii Convention Center for 2-days on Saturday, March 13 and Sunday, March 14. The students were assigned as director, presenter, interviewer, cameraman, monitoring and sound man. They learned their tasks in such a short time. The first interview was scheduled at 11 a.m. Each student played their role to make it successful. 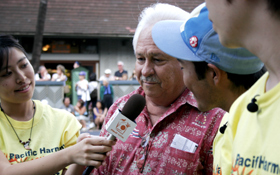 Afterwards, the students interviewed the guests, performers and exhibitors of the crafts to ask their opinions on the next generation as well as the Honolulu Festival. As the time passes by, the students were serious with their assigned tasks but at the same time, they were enjoying as well. We were amused by the creative ideas that the students came up with such as reporting their experiences at the Honolulu Festival and so forth. 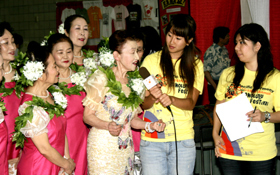 Furthermore, “Share Your Voice with the Next Generation” was connected to the sub-theme of the 16th Annual Honolulu Festival, “Discovering Through Tradition”. It was launched for the next generation to spread the words by listening to the teachings of people from various countries and older generation. We believe that this project was a valuable opportunity for the next generation to touch the feelings of others. 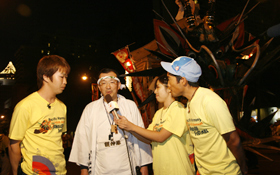 The second part of the project was to live stream the Grand Parade online. 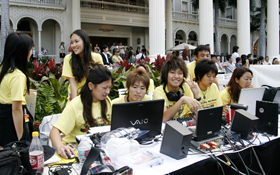 The booth was set up in front of Moana Surfrider, A Westin Resort & Spa, where there were seats reserved for the V.I.P. The students were interviewing the performers and spectators before the parade. When the parade began, the students were reporting the scenes to the world. Also, the students interviewed Mike McCartney from Hawaii Tourism Authority, Donald Yannell from our sponsor First Bank of Hawaii, Kirk Caldwell, who is the Vice Mayor of Honolulu; Paul Cortez from Philippine Consulate General in Honolulu, the Goodwill Delegation from Hiroshima, and the members of the Omuta Daijayama that came to support the Honolulu Daijayama. The Honolulu Festival will continue to offer many opportunities for the local communities and schools to strengthen the relationships with them and provide a place for cultural exchange with the people around the world.